Four years ago, I started getting the itch for a 1:1 classroom. I wrote grants, begged for computer lab access, and did everything short of kicking and screaming to get what I wanted. Halfway through the school year, I received a Chromebook for every student as part of a campus experiment. Then, I received ten more to try as part of a district experiment. This was all after receiving two iPads from a grant. We had more computers than students, and, in some cases, twice as many. Be careful what you ask for ... I got it! Not the computers. I learned what it was like to manage a classroom that could shift gears without a trip to the copy room. I learned how we could collect ideas, concerns, and questions from the entire class and use it all as part of the lesson content, merging student voice and formative assessment. But still, it wasn't enough. I constantly had this feeling like something was missing. We went beyond replacing paper worksheets with digital ones, and the lesson plan would never be the same because it could change drastically based on student needs. Homework was shrinking to almost nothing because we were getting so much done with our class time, yet I had a feeling like there was something more we could do. I was fortunate to have attended a keynote by Alan November the previous summer, so I bought his book and read it almost in one sitting. It's not a long book, but the stories jumped off the page because they showed me what we were missing in our "one-to-too-many" setting. The book presents the idea that classrooms, like farms, are places where things grow. 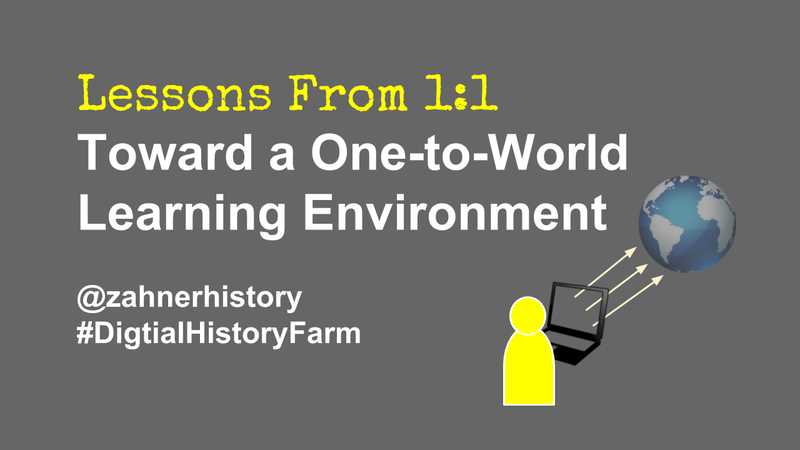 Alan calls it the Digital Learning Farm. Being a history teacher, I couldn't help but relate it back to Thomas Jefferson's concern about how industrialization would take away our freedom because of how we would become slaves to the clock. 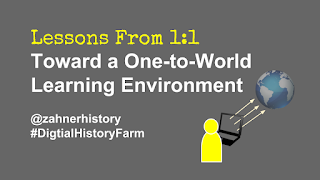 Classrooms and schools have long been criticized for being too stuck in the industrial model, so I embraced the digital learning farm. Perhaps the Web is like a farm, yet students can grow by cultivating knowledge and making publishable things that can be harvested to feed the world. Maybe connected technology would bring together the best of both industrial and agrarian economies to make an Age of Information that even Jefferson could appreciate. I'm not there, yet. I have more to learn, which is why I've decided to write about it here and share the project that I am working on. 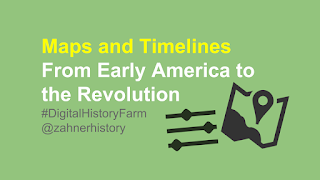 It's called the Digital History Farm. I wanted to specialize my approach a bit because there are a lot of resources being developed as digital history. It's huge, actually. These are resources that my students can both learn to better access and make contributions to if I implement some of Alan November's approach to technology integration. For example, instead of reading clips of primary sources and secondary interpretations, which are important, my students made a spreadsheet of all of the items and amounts taxed by the Stamp Act. Alan November's ideas about 1:1 are not aimed at discouraging the initiatives. He knows, however, that too many schools have placed the selling point and vision on the device instead of the connectivity, the opportunity, and what it means to foster Web skills that can leverage powerful databases to find and solve problems. My lesson designs have plenty of room to grow, especially when it comes to providing opportunity for new lines of inquiry and broadening the conversation to engage authentic audiences from around the world (https://goo.gl/vEUX0Y, accessed 12-30-16 at 10:55 EST). At the publishing of this post, the pages in the horizontal navigation of the Digital History Farm blog were incomplete. The goal is make the blog a place for resources as well as sharing of the featured content made by students. The project will grow and likely change, so stay tuned for updates. 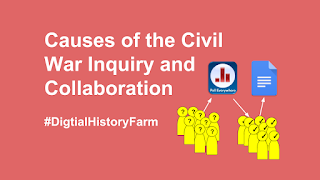 Please leave a comment on the Digital History Farm if you have suggestions. When the preview for the new Google Sites came out last summer, I got excited and frustrated all at once. The new Sites looked great and was easy to use, which means my students were likely to pick it up quickly. But I was also frustrated because I couldn't do a lot of the things that the old platform allows. This situation prompted me to consider whether or not my students even need to make a website with Sites, new or old. After all, I want them to learn skills and experience the audience that comes with publishing their work online. 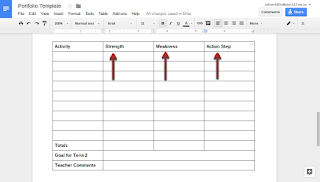 I chose to teach with Google Docs as much as possible. There's so much you can do with it, including publishing to the Web. 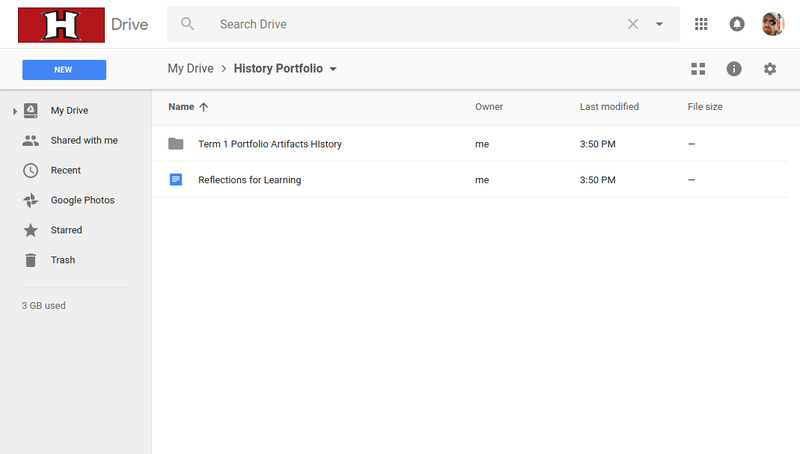 Plus, teaching with Google docs allows students to choose their platform in the future. 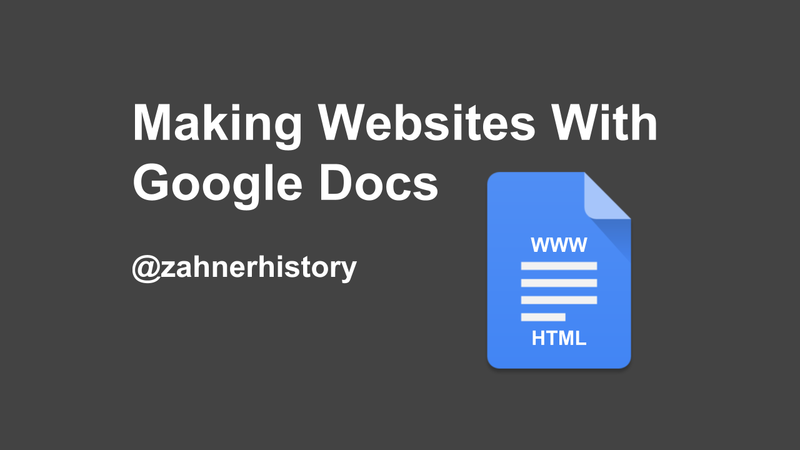 Here are a couple ways to make it happen with Docs. Docs has a feature in the File menu that allows you to publish a document to the Web. It comes with a default header and footer, but it's really quick. This way of publishing is good for working across devices (smartphones, tablets, full browsers, etc) and publishing simple documents like agendas or a syllabus. If you are looking for a more appealing product, I recently found WWW Drive. 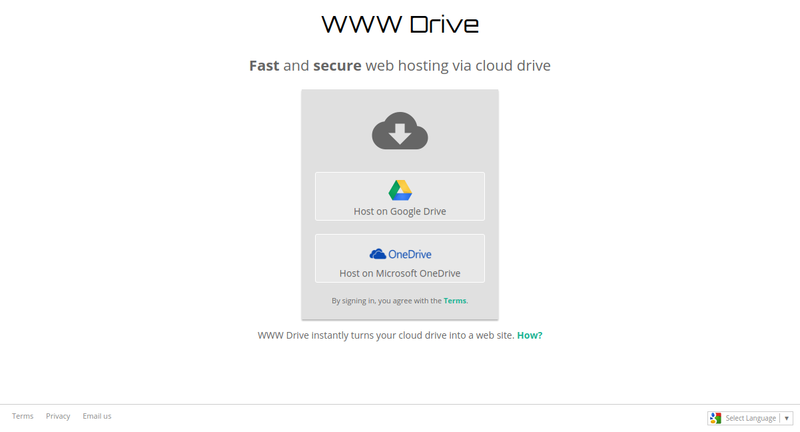 The nice thing about this tool is that you can host your site from Google Drive or Microsoft OneDrive. Here are the steps I took to make it happen. 1. Download your Doc as an html file. 2. Unzip your files and organize them in the proper folder. Open file in zip extractor. Move files out of the unzip folder. Share unzipped files so they are searchable on the Web. 3. 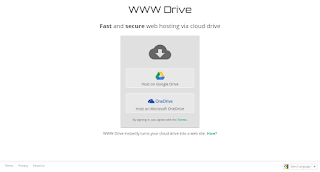 Go to https://www-drv.com and click the cloud storage you want to use. Make sure you are signed in to your account. 4. The site will take you to an admin panel where you will find links to your published html files. Tip: Use a link shortener like bit.ly or goo.gl to make sharing easy. Every time I read through term and semester portfolios, I find students who under perform on exams yet blow me away with what they showcase. Their ability to reflect on the activities and organize their products is super exciting. I also see the opposite from some of the best test-takers. No one cares about your grades after a certain point in life. Employers and customers want to see what you've done. They want to know that their time and money will give them a return on their investment in you. In other words, our kids have to learn how to sell themselves in order to be successful. I want more than scholarships and entrance to amazing colleges for my students. I want them to understand who they are, what they want to do, and how to best present themselves to realize their dreams. This comes from routine reflection, making thinking visible, and learning in an environment that doesn't stress them in unhealthy or irrelevant ways, which is often what too much testing will do. I've been working on portfolio activities for about three years, and I'm confident that I have many of the critical pieces. I'm also confident that this kind of summative work supports the learning process at the course level far better than final exams, especially if the goal is to educate the whole child. Plus, portfolios are more authentic. They simulate the kind of work my students will be expected to do for many of the jobs in our economy, which is increasingly leaning toward information-based skill sets. Knowing that students can only show quality work if I assign quality activities, I try to give them opportunities to take risks and show their creativity while exploring new information. 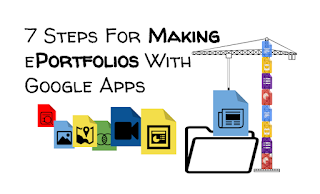 The portfolio, from this point of view, holds me accountable for not assigning too much waste basket work – the stuff that drives too many classroom and occupies too much space in gradebooks. 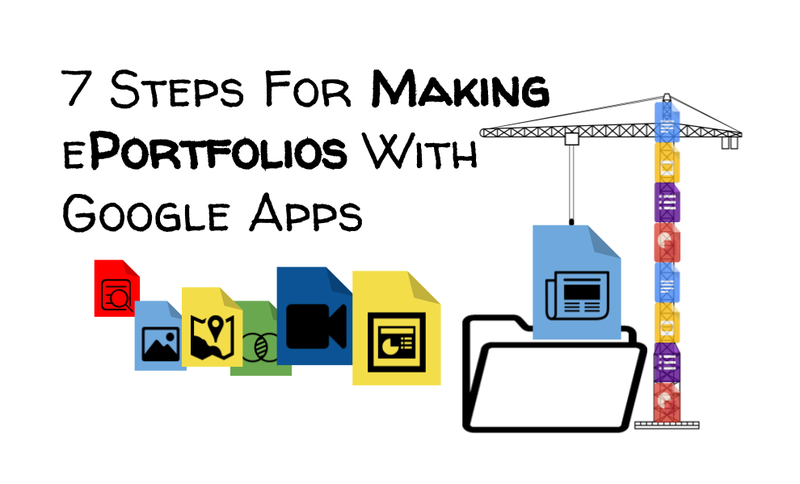 It's important to remind students that the work they do will be included in their portfolios. Since many of the individual assignments do not receive scores in my class (feedback only), students need to keep the end in mind so they don't become too complacent. We keep a running list of the activities as the term progresses. This allows students to reflect holistically on the coursework and catch up on their portfolio tasks so they don't scramble at the end. I've heard of some teachers using Google Calendar to manage mini-deadlines, as well as simple tables in a Word or Google Doc. Staying organized in the digital world is just as important as it is working with analogue materials. As students complete activities, they need to keep their work in a folder along with a document for reflections and any images of their work they may want to include in the showcase portfolio. Digital files can be lost easily, so naming conventions go a long way for consistency in a classroom. The skills that kids learn from the English teacher who requires the same heading on every assignment are very relevant in the age of information. Just because our work is a bunch of ones and zeros doesn't mean the traditional expectations should be thrown out, although sometimes it's interpreted that way. 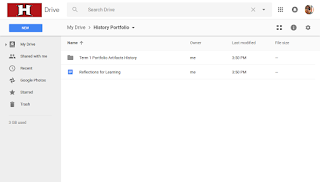 Since my students use Google Drive, I dictate the name of the folder in Drive to avoid confusion when referencing it during instruction. I hope my students experience the efficiency of responsible file management and don't end up like my father with 5,000 photos on his phone and no idea what he should do with it all. Formalizing reflection has been one of my goals this year. In years past, I've incorporated opportunities for reflection into lessons, but this year it's been about making reflection a classroom routine. Students wrote reflections after completing activities, regardless whether the activity would make it to the showcase portfolio or not. The reflections were written on a single Google Doc to stay organized. Students wrote paragraphs that responded to the following questions and were asked to use specific examples to support their responses. What did you learn by doing it? How can you use what you learned outside of school and beyond? The final product is often called the showcase, portfolio, or showcase portfolio. It can be put together in a variety ways, using a bunch of different tools to present the final product. 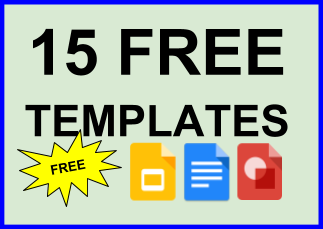 Some examples of tools include Blogger, Google Docs, Google Slides, Google sites, YouTube, Wordpress, and Storymap, to name a handful. 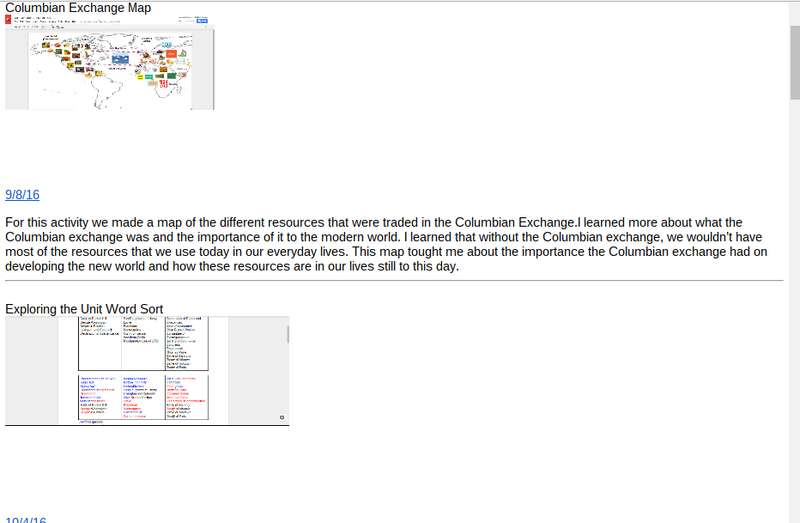 As shown in the image below, my students use Google Docs because it's simple and free. I don't like taking much instruction time to teach kids how to use new tools. Sometimes it's necessary to do so, but it can come to dominate the time if you're not careful. I would prefer to teach technology concepts, such as links, formatting images, and designing for use on a variety of devices. 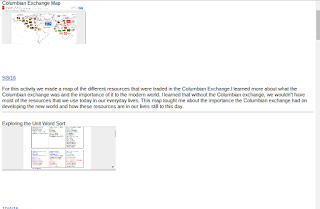 Google Docs is publishable (see video below) and has all that the kids need to present their artifacts and reflections. It's also a great opportunity to teach the concepts I listed above. The same process could be done with Microsoft, of course. I chose Google because that's what my school uses. As with any formative assessment, the goal is to give shape to future activities. This means students reflecting on what they need to do and teachers redesigning activities to meet the specific needs of their students. 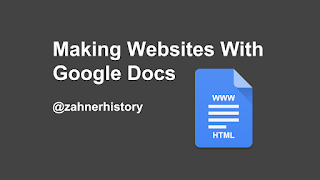 We often use a Google Doc to share links to group work if we need to see the product for class discussion. If the activity is more about the writing or information, we use Google Forms to collect responses and project them with the overhead. You can use Padlet for both of these situations, but I like to use as few tools as possible. Too many accounts can get annoying. Many teacher evaluation systems are driven by goals, and the goals are often written by the person being evaluated. Why wouldn't we do that with our students? My students write a goal based on a pattern that they find in their weaknesses. 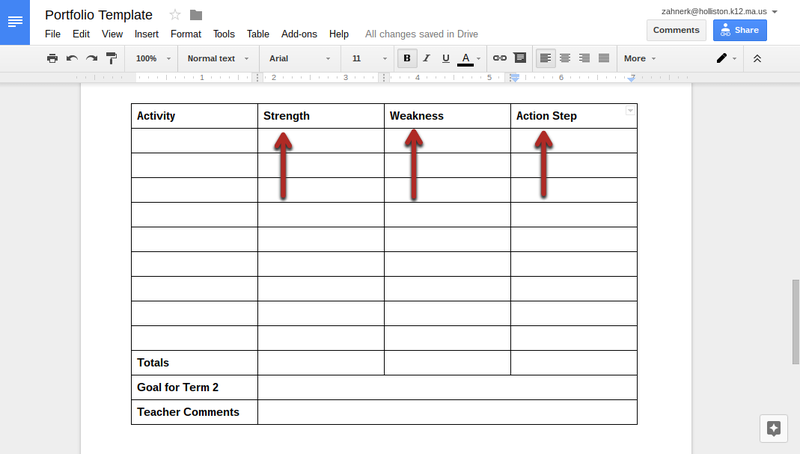 The image under Step 7 (see below) shows the table where students list the activities, including columns to the right for strengths, weaknesses, and action steps. They look for the most prevalent weakness on which to base their goal, often focusing on skills. The first round of goal writing is sometimes weak, so it's important to teach students SMART goals, for example. The blue text in the image below is teacher feedback. I require my students to rewrite their goals and resubmit for approval because their summative evaluation at the end of Term 2 is based on the Term 1 goal. The Term 2 summative evaluation is based on the following question. To what extent did the learner achieve the goal? This time, the portfolio items are chosen as evidence to support the student response to the question. Whereas the Term 1 portfolio is about setting the bar from which students can individually assess and evaluate their achievement, Term 2 is about evaluating the progress on a goal because our classes are on a semester schedule. If your schedule is yearlong course, you would want to adjust this process accordingly. A yearlong course would allow students more time for reflection and collection of evidence. I found it much easier to implement portfolios in a yearlong schedule versus the semester schedule under which I currently work.